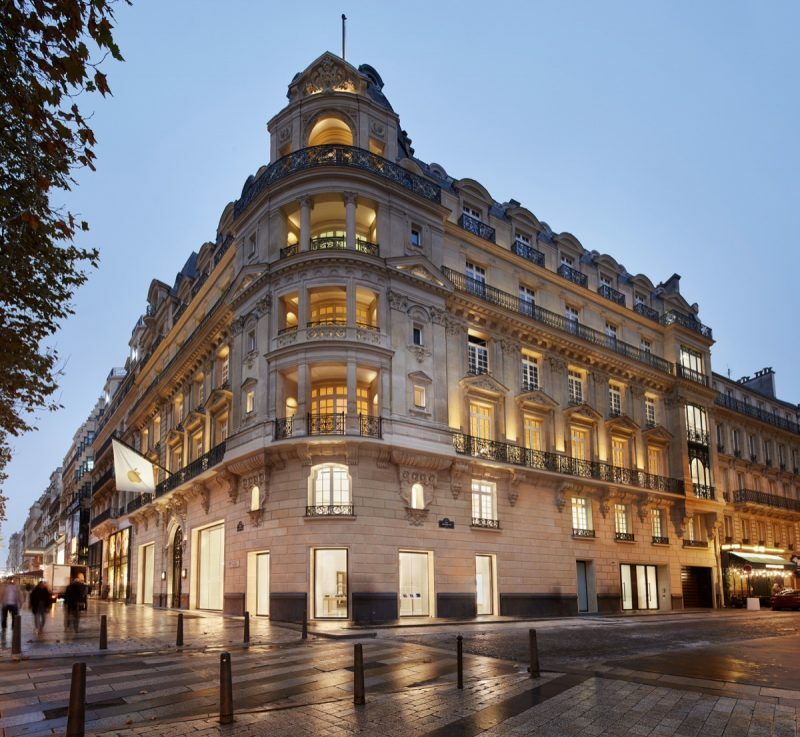 Apple today officially announced its latest retail store, Apple Champs-Élysées in Paris, located on one of the French city's most iconic streets. The store opens on Sunday and will replace the nearby Apple Carrousel du Louvre, which permanently closed in October. 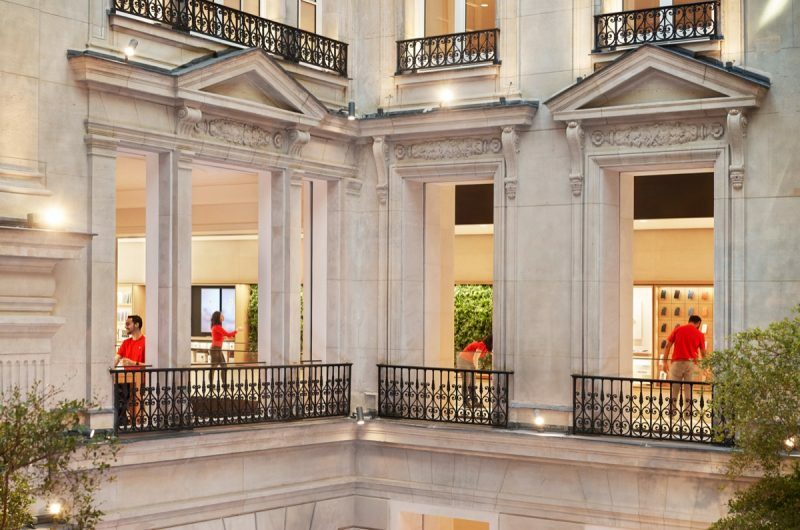 The store occupies a Haussmann-era apartment building, featuring what Apple is calling its "grandest" Forum dedicated to free Today at Apple sessions, which focus on photography, music, coding, and design. In the first week, Apple Champs-Élysées will host sessions with popular musicians, filmmakers, animators and more. "The energy in Paris is electric and it will be one of our premier cities for Today at Apple," said Angela Ahrendts, Apple's senior vice president of Retail. "I hope that everyone who visits Apple Champs-Élysées will be inspired to unlock their creative curiosity and learn something new." Apple has restored the facade and entryway, and extended the Burgundy stone from the exterior throughout the building. Meanwhile on the upper levels, French oak parquet floors detail the interconnected spaces of the Parisian apartment. "Working within a historic Parisian building is a great responsibility and a phenomenal opportunity," said Jony Ive, Apple's chief design officer. "Our first priority was to honor the history of the building, while thoughtfully updating it to create spaces both grand and intimate. The carefully interweaving layers are warm and light filled, celebrating the timeless spirit of the city." Environmental concerns have also played a part in the architectural design at Apple Champs-Élysées. For example, the courtyard is covered by a roof light that provides natural illumination and helps generate renewable energy, thanks to integrated photovoltaic panels. In addition, an integrated rainwater collection system provides water for the bathrooms, trees and green walls, ensuring the store maintains Apple's commitment to 100 percent renewable energy. More than 330 employees, including over 100 new hires, will welcome customers when Apple Champs-Élysées opens its doors on Sunday at 12.00 p.m. local time. "The energy in Paris is electric"
With places like these it’s no wonder why their products get more and more expensive.